In the span of a few decades, the world has witnessed a technological revolution, which has generated economic and social change at an unprecedented pace. Today, an app on your smartphone can help raise awareness of a social cause worldwide and help a farmer activate the sprinklers to water her harvest in a remote area. Yet, not every change has brought an advantage: as echoed by this year’s Right to Food and Nutrition Watch, the dominant use of technologies is bringing questionable benefits to social justice, and more concretely to decreasing hunger and malnutrition rates. Food – a key component of life, identity and social relations – is being transformed into an immaterial commodity, and a source of data, which is opening a Pandora’s box of profit for corporations and the mega rich. This, in return, is affecting rural communities by further taking away their resources, damaging the environment and changing our diets for the worse. The actors that promoted the agro-industrial model now recognize its failure but claim to have found an “innovative solution”, under the umbrella of the so-called Fourth Industrial Revolution. This is entailing a fusion of technologies that is blurring the lines between the physical, digital, and biological spheres. Within this context, three intertwined dynamics, are marking our era: dematerialization, digitalization and financialization. The dematerialization of food is promoting the decrease of the physical substance of food and the increase of the market value of its immaterial dimensions. The latter is becoming larger than the actual value of food, from the cost of advertising, financial remunerations to investors, skyrocketing profits of large distribution channels and sophisticated attempts to use food purchases to gather information on consumers. 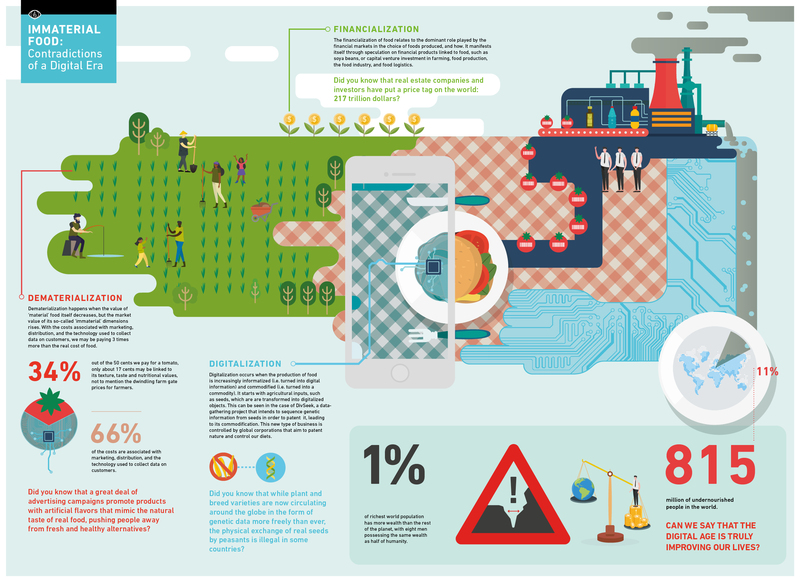 The digitalization of food leads to an increasingly automated, delocalized and informatized process of production and commercialization of food. This starts at the level of agricultural inputs, with seeds and other plant genetic material being transformed into digitalized sets of information, while peasants are increasingly criminalized for their exchange. This also applies to people referred to as “consumers”, which are now subjects of data-gathering mechanisms by food corporations that employ algorithms to categorize them and generate personalized offers for food they eat. The criteria that applies has little to do with preventing obesity and diabetes and other diet-related diseases, but rather with making profit and controlling people’s diets. The financialization of food comes as a result of the dominant role played by the financial markets in determining which foods are produced, and how they are produced. It manifests itself through speculation on financial products that are linked to food, such as soya beans, or capital venture investment in farming, food production, the food industry, and food logistics. This also drives the transformation of agricultural resources, such as land, into financial assets that can be the subject of acquisitions and re-sales for profit in international financial centers. Local and rural communities, however, find themselves dispossessed from these resources with no consultation. Technologies are not detrimental to the right to food. These have all the chances to contribute to decreasing hunger and malnutrition rates. The problem lies with how these are used and for which purpose. The current use of technologies is being driven by vested interests, often by large corporations, whose primary and sole objective is profit. Meanwhile, people whose human rights are most at risk, simply have no say in or access to these technologies. Social movements and human rights advocates need to further integrate the issue of technologies within their discussions. They also need to find ways to democratize the access of technologies, as well as lead the creation of new technologies that significantly contribute to social justice.